This hunt speaks for itself. 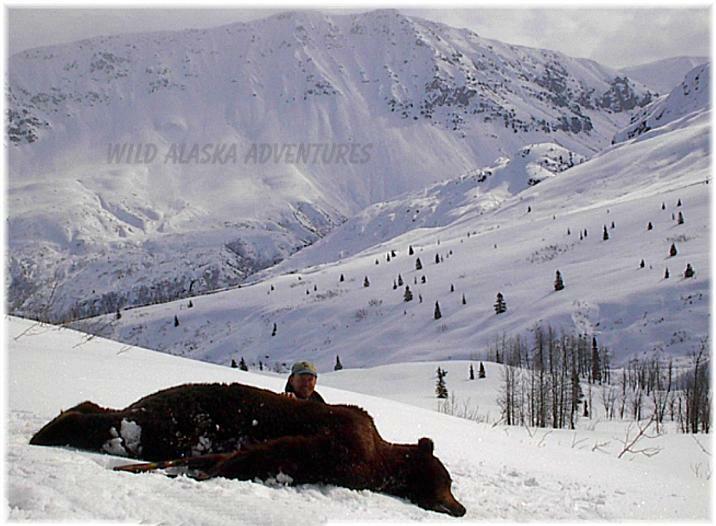 The game management unit we hunt along the Alaska Range has some of the highest Brown bear densities in the state. 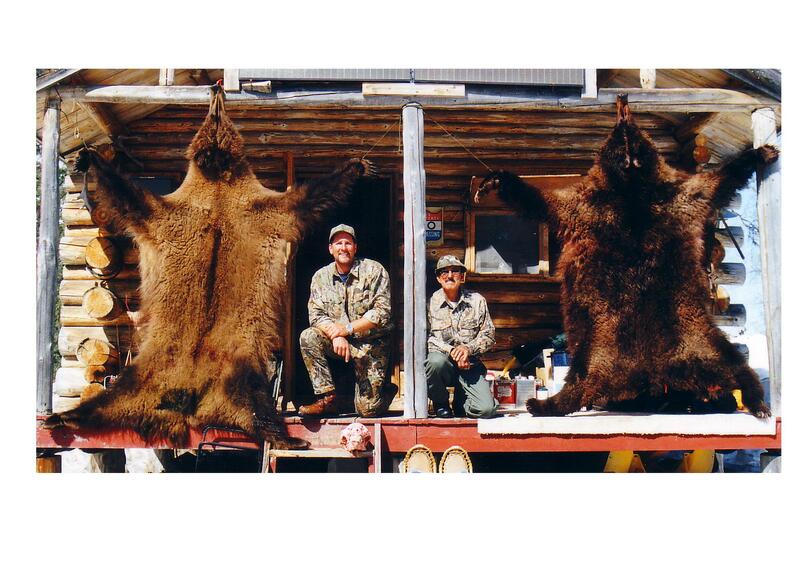 The numbers are so high that ADF&G has allowed a TWO BROWN BEAR PER YEAR limit. We also have over 85% success rate on this hunt as well. Once we see sufficient numbers of Bears out of their dens we place you in the field . it has not used them all winter and the sun hasn’t bleached out the fur. We use spike tent camps placed in areas with known multiple dens sites as well as areas that Bears travel after leaving their dens. 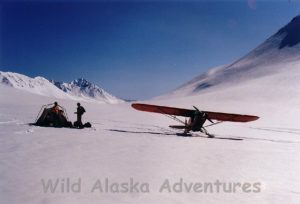 You will fly into our base camp from Anchorage via air taxi and have the comfort of cabin living and home style meals. Once sufficient numbers of bears have come out we fly you into a spike- tent camp with your guide for your first night in the Alaska Range mountains. 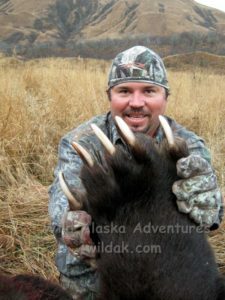 Early the next morning is the beginning of your Alaska Brown Bear hunt. And this is flying you most likely have never experienced before. Where we fly and land is an experience in an of itself. The snow is very deep but its spring snow. We use snow shoes for travel and there has been more good weather than bad the last several years during mid to late April. The snow is very deep but its spring snow. We use snow shoes for travel and there has been more good weather than bad the last several years during mid to late April. Our Brown bears have measured from 7ft to over 10ft . The elevations of camp sites range from 1000 ft to close to 4500 ft.
You will need your personal hunting gear for the stated temperatures as well as sleeping bag and bed roll. Hunting whites can be supplied as well as snow shoes. A complete list of recommended gear and weight limits will be provided. April 15th and May 5th. Air taxi flights into camp will be scheduled for you but you are responsible for cost. This hunt will provide you with some of the best Brown bear hunting and with out a doubt best scenery Alaska has to offer all in one. I am more than happy to answer any questions you may have about this hunt. I am looking forward to hearing from you. 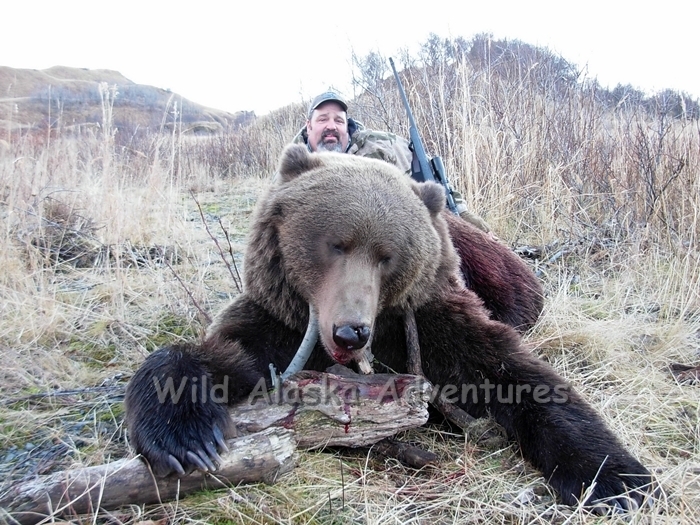 Our Spring Kodiak Brown Bear hunts Differ from Our Alaska Range hunts in several ways. 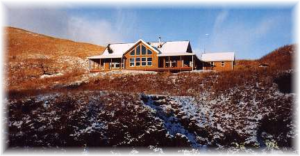 The Lodge is based in the heart of one of the most densely populated Brown Bear area’s on the Island. This allows us to hunt directly from the Lodge on foot with great success. Viewing more than 10 Brown Bears from the deck on some days is not uncommon. This is also a drawing hunt with the application period in December. The success rate for drawing varies from year to year but some years have seen more than 40% draw rate. You wont find better accommodations or bigger Brown bears all in one spot. 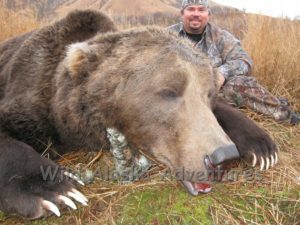 Our goal is to see that your hunt IS the hunt of a lifetime! WE WILL provide the personal service and go the extra mile drawing on all our resources and experience to make this the best hunt you ever went on.